On this web page "Algebra formula calculator", we are going to have the calculators of (a + b) to the power "n" and (a - b) to the power "n". And also we are going to see the list of identities and their expansions which are being used to solve all kinds of problems in algebra. Please click the below links to get the calculator that you want. 1. Expansion Calculator for (a+b) to the power "n"
2. Expansion Calculator for (a-b) to the power "n"
On this web page "Algebra formula calculator", apart from the calculators, let us look at the expansions of algebraic identities. In algebra formula calculator, when we have negative sign in the identity, it will give the expansion accordingly. But how to remember that ? You will get answer for this question in the next part of this web page "Algebra formula calculator". How to remember algebraic identities expansions with negative sign? 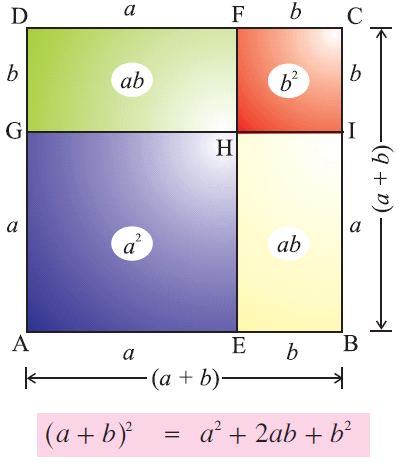 We can remember algebraic identities expansions like (a+b)² (a+b+c)², (a+b+c)³. In the above identities, if one or more terms is negative, how can we remember the expansion? This question has been answered in the following two cases. We can easily remember the expansion of (a + b + c)². How can we remember the expansion of (a + b - c)² ? In the terms of the expansion, a², b², c², ab, bc, ca, let us consider the terms in which we find "c"
They are c², bc, ca . Even if we take negative sign for "c", the sign of c² will be positive. Because it has even power "2". The terms bc, ca will be negative, Because both "b" and "a" are multiplied by "c" which is negative. How can we remember the expansion of (a - b - c)² ? In the terms of the expansion, a², b², c², ab, bc, ca, let us consider the terms in which we find "b" and "c"
They are b², c², ab, bc, ca. Even if we take negative sign for "b" and "c", the sign of b² and c² will be positive. Because they even power "2". The terms "ab" and "ca" will be negative. Because, in "ab", "a" is multiplied by "b" which is negative. Because, in "ca", "a" is multiplied by "c" which is negative. The term "bc" will be positive. We hope that the two calculators given on this web page "Algebra formula calculator" will be much useful for students. Apart from what has been given on this web page, if you want to know more about algebraic identities expansions, please click here.